Did you know that different flowers have different meanings? Some represent sadness, while others indicate happiness and pleasure, modesty, friendship – and even jealousy or desire. When planning your wedding in Tuscany make sure the flowers in your bridal bouquet are symbols of your joy, love and romance. At BeA Alfresco Wedding we are aware of the special meaning of flowers, and will guide you—not only in your choice of bridal bouquet—but also in the significance of the flowers you would like to have in your bouquet. The calla lily is a very popular flower often used in bridal bouquets; in fact, I used it in my own bouquet because of its meaning, which is femininity, grace and purity. Peonies are another popular choice, and have a special importance for Chinese people. Because they were popular with the imperial rulers of China they are associated with honor and nobility. The peony, therefore, is an indication of power and riches; and thought to be a good omen for a happy marriage, good luck and fertility. Grown in Tuscany, their pale pink, cream and lilac blossoms will make a beautiful display at your wedding. If you choose carnations for your bouquet, you should be aware that their different colors have different meanings. Just as with many other flowers, the meaning of carnations changes with the color of the flowers. Dark red carnations indicate a deep feeling of love, while the light red carnations express admiration and respect. White carnations express good luck and purity, and pink carnations communicate a feeling of gratitude. 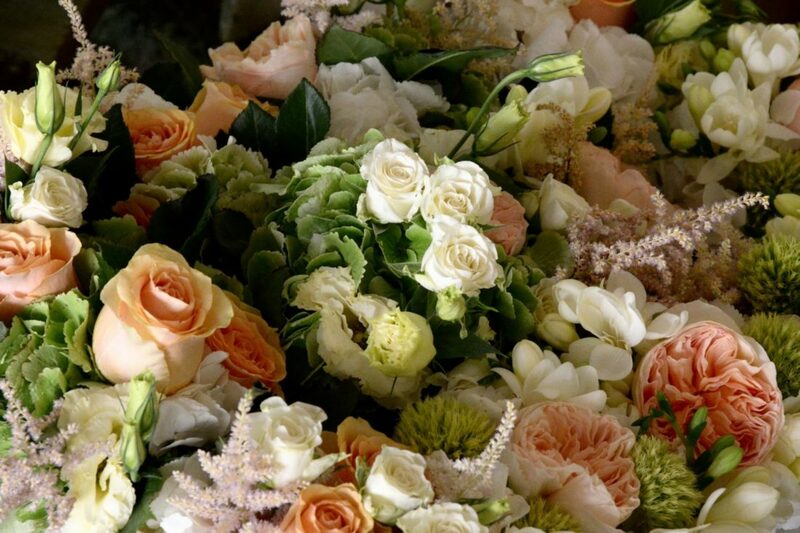 Roses, the universal flowers of love, come in so many colors it will be difficult for you to choose the perfect color for your bridal bouquet for your al fresco wedding in Tuscany. Even the number of roses represents a sentiment! Red, dark red and burgundy roses all signify love and beauty; while white roses symbolize innocence, purity and reverence. Red and white roses in a bridal bouquet signify unity—a very good choice for a wedding!